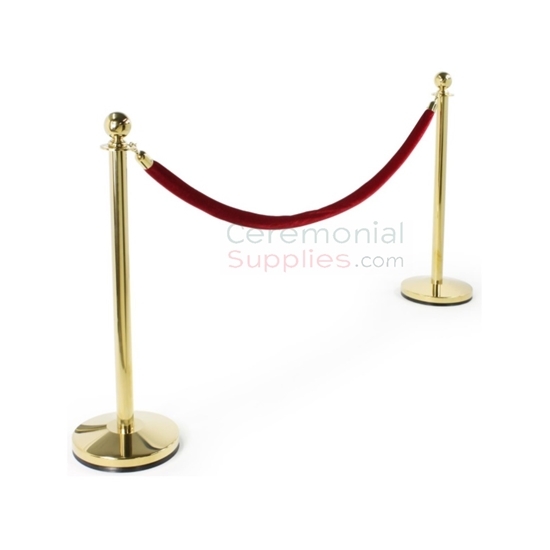 The perfect tool for crowd management at luxurious events and elegant venues such as theatres, art galleries, and government buildings, the endlessly versatile Luxury Brass Stanchion and Rope Queue Management Set makes sure all your queue management needs are met with your event’s overall luxurious décor remaining intact. Since your purchase includes both the stanchions, and the velvet rope needed to cordon off certain sections and facilitate movement in one single package, the effort needed at your end in organizing the required equipment is minimized. For various other options in regards to luxury stanchions intended for luxury events, please browse through the stanchion selection CeremonialSupplies.com has to offer.